A whelk looks strange. It is slimy. It smells like sea and mud. Some call it ugly. Just look at this photo! But a whelk is also delicious! Especially with homemade mayonnaise! Moreover, it is rich in protein: around 20g of protein per 100g, which is more than what lamb contains. Would you have believed? In addition, a whelk is rich in vitamin B12, copper and zinc, making whelks more than ten times richer in B12 than beef. Impressive how good these slimy creatures are for us! You can buy raw whelks and boil them for a few minutes with salt and black pepper, but supermarkets in France sell them ready-cooked. 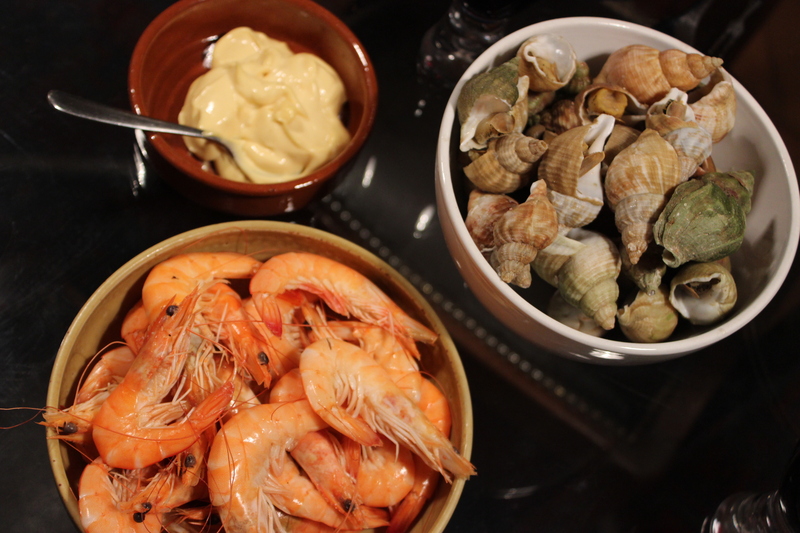 This is what we did yesterday: we purchased shrimps and whelks and ate them with mayonnaise. Afterwards we had a cheese platter with salas. Such a perfect dinner. Easy (no cooking needed), affordable, tasty, healthy. And as a bonus, gluten free. If you are interested in whelks, maybe you would like to read this article by the New York Times: http://www.nytimes.com/2012/12/19/dining/whelks-are-coming-out-of-their-shell-and-onto-your-plate.html (December 2012). Apparently the whelk has surfaced on cutting-edge menus in the US, and chefs are creating some very interesting-sounding dishes of them. Why not to try when you next time see them on the menu? Tip number 1: The only thing you really need to be aware of when eating whelks is that little tiny “lid”. It is the thin top part of the whelk, and should be removed by your fingers and thrown away. Tip number 2: You need special equipment to eat whelks with. A normal fork won’t do it. 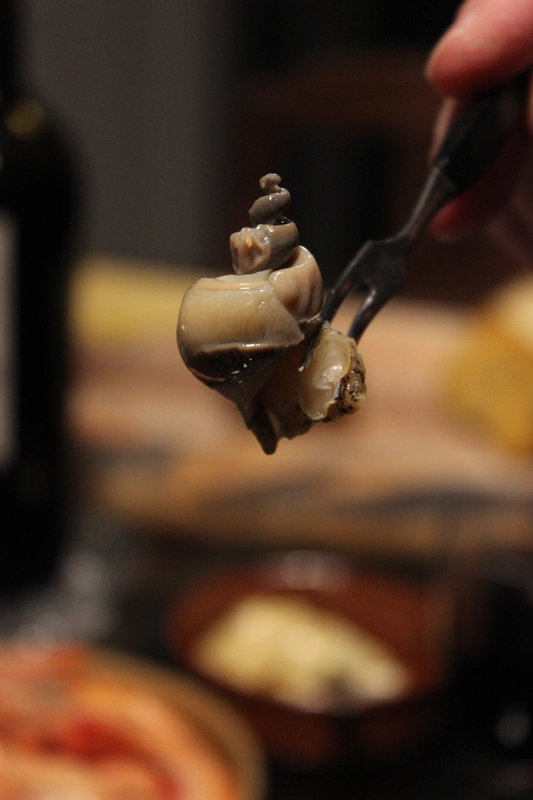 Tiny forks or pins are the only efficient ways to pull the whelk from its shell, believe me. PS Have you already tasted a whelk? What was your impression? How was it prepared and eaten? Did you have red or white wine with it? We had biodynamic red (Côtes du Roussillon, Marie Gabrielle Cazes, Languedoc), creating a nice match. If you haven’t yet tasted the whelks, do you think you will one day? This entry was posted in Uncategorized and tagged biodynamic wine, food, France, gluten-free, Languedoc-Roussillon, organic wine, Paris, recipe, wine on February 16, 2014 by Miia. Love them, just some time there is still sand inside.. I like to eat this on sunny days, a good snacking! Do you eat them with mayonnaise? I wouldn’t try the vinegar, but your cheese suggestion is nice! Hi Andy! Interesting, I have only ever eaten them with mayonnaise 🙂 Are they imported in Mallorca and if yes, from where?